Page 6 - Play Today | KaBOOM! As the enormity of the tragedy in Newtown, Conn. sets in, parents search for ways to help their children in a seemingly hostile world. Many sites help guide parents on what to say and how to address the crisis, based on the child’s age and comprehension of the situation. These are extremely important to review and have at the ready if and when your child is ready to talk. Whether or not you’ve had “the talk,” know your child needs more at this critical time to feel loved, safe, and secure. Despite our compelling need for more information regarding the crisis, this is the time to put down the electronics. Put on a pair of jeans and get down on the floor to play with your child. 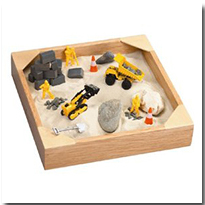 Bring out the favorite stuffed toys or action figures, the building blocks, trucks, and ponies. 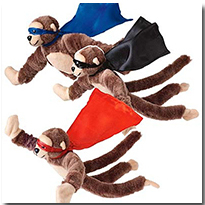 Children feel safe expressing their feelings when they pretend with toys. Keep the play open-ended. 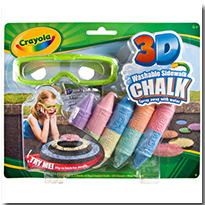 Let your child create the dialog and scenarios. Respond to expressed emotions with neutral and supportive comments (e.g. that must have felt scary for McQueen; looks like Thomas is very angry). Play on the floor. 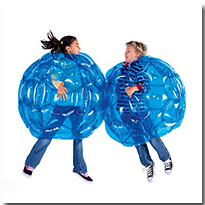 This allows you to move around using large muscles, which relieves stress and calms the child down. Don’t force the issue of expressing emotions. 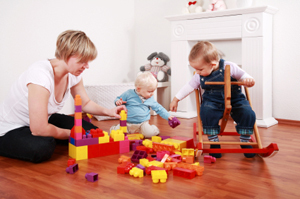 When a child sees a grown-up close by, playing on the floor, they intuitively feel more secure and loved. 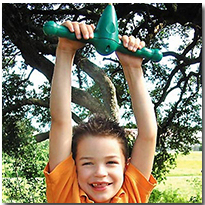 For older children, create outlets for pent up feelings. 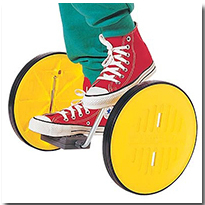 Doing a physical activity alongside your child (e.g. a walk or jog) or playing a board game creates the space to have a heartfelt conversation without the pressure. For very young children without language, bring cushions, pillows and comforters to the designated play area. Climb over pillow-mountains and crawl under blanketed tables. Create a sense of adventure. 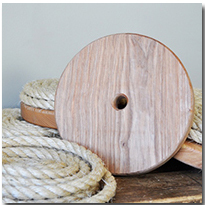 The movement creates a calming response in the brain. It will help you and your loved one feel better. After all the horseplay, curl up with a favorite book and hold each other tight. Big hugs help the most. 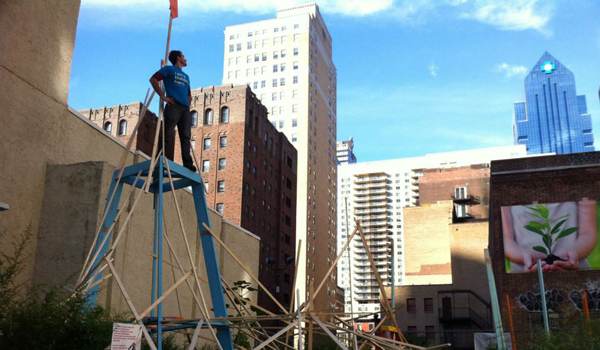 If you thought knitting a sweater required patience, try knitting a playground. 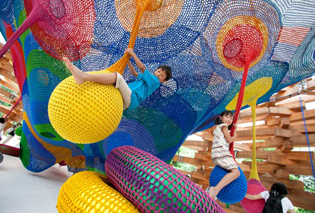 That’s right—Japanese artist Toshiko Horiuchi MacAdam (pictured right) challenges our understanding of what a playground can look like by creating breathtaking, interactive “sculptures” from colorful nylon ropes. "One day I was exhibiting a 3-dimensional open-work textile sculpture I had created in collaboration with a friend. Some children came to the gallery and climbed into it. Suddenly the piece came to life. My eyes were opened. I realized I wanted just such a connection between my work and people alive at this moment in time (not a hundred years from now). I realized I was in fact making works for children. It was an exciting moment for me. "I was teaching at the Bunka Institute in Tokyo at the time and with 2 of my students I began to look carefully at the situation for children, in particular regard to play. We spent the next three years, mostly weekends, visiting all the parks and playgrounds in central Tokyo. "The result of our research was depressing. At the time the country was narrowly focused on economic development; few were considering the effects on children of growing up in cramped, high-rise apartments, watching television, often an only child without brothers or sisters to interact with. I was very worried about this. I felt I needed to do something to bring even a little change. 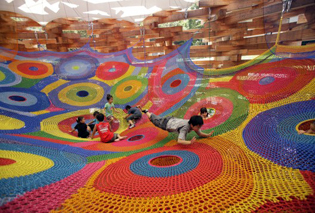 Top photos and bottom left photo: Wonder Space II, by Toshiko Horiuchi MacAdam and Interplay, at Hakone Open Air Museum. 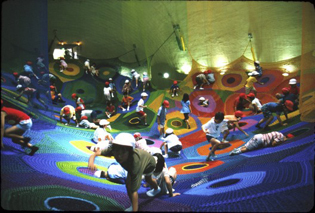 Bottom right photo: Rainbow Nest, by Toshiko Horiuchi MacAdam and Interplay, at Takino Suzuran Hillside National Park, Hokkaido, Japan. All photos © Masaki Koizumi. "The crochet forms I make resemble the mother’s womb. 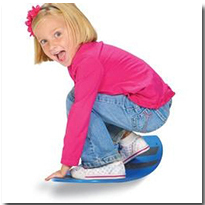 The soft, elastic surface is familiar to the child. 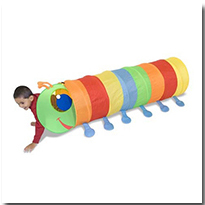 The net membrane is sensitive to the child’s slightest movement capturing his energy and transmitting it back to him. 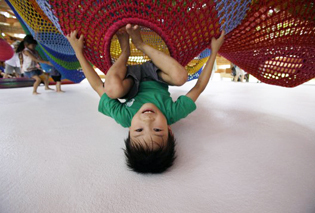 The wave-like motion of the net connects him with other children and they start playing together. 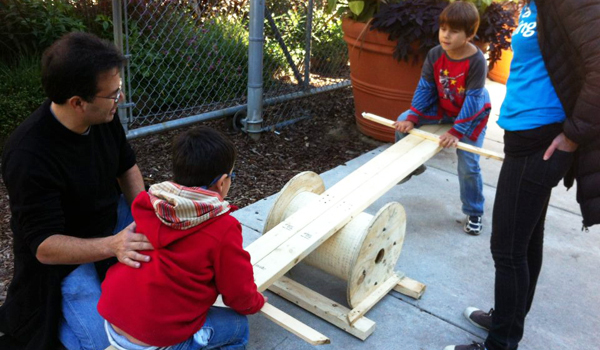 Their creative minds start to move and they find new ways of playing. They respond to each other. 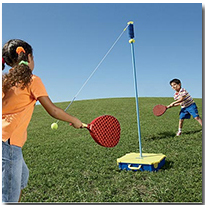 It is sometimes hard to entice children out of the net; they can sometimes be lost in it for 3-4 hours. 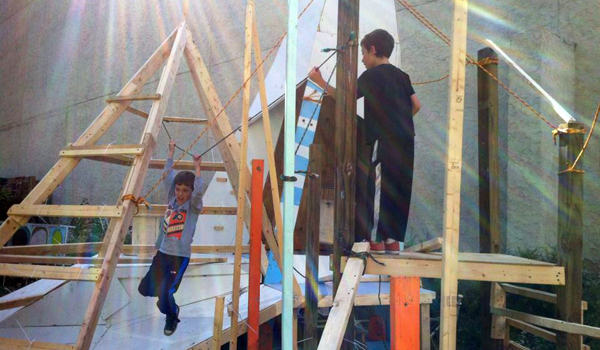 "Our structures encourage children to challenge themselves but with many routes and options. There is no program of play. There are always alternatives. 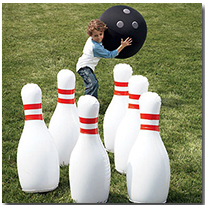 Each child plays at the level he or she is comfortable with. From forty years’ experience I have learned a little about children’s psychology. 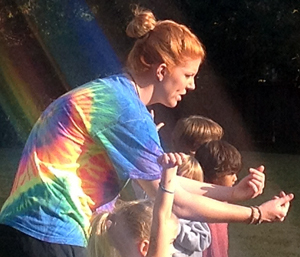 "Some groups of children come regularly to play on their own; their play is fantastic. They know what they are capable of and then stretch just a little further, becoming more and more adept. Some of their maneuvers are heart-stopping to a bystander – but they know what they are doing. "Often it is parents who are the problem. They seem to have forgotten what it was like to be a child." Special thanks to ArchDaily for sharing this excerpt. Read the full interview here. 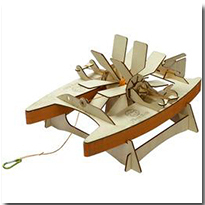 When it comes to toys, we have long vouched for the stick and cardboard box. But of course, your kids are expecting a little more under the tree. 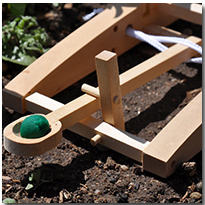 Along with the gizmos and gadgets that are sure to top many wishlists, we hope you'll consider some toys that facilitate good old-fashioned outdoor play. 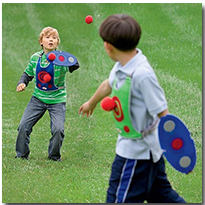 After searching high and low for some of the most unique and affordable outdoor play toys on the market today, we are excited to present you with 25 gift ideas that will get your kids moving, fuel their imaginations, and most importantly, bring a smile to their faces. 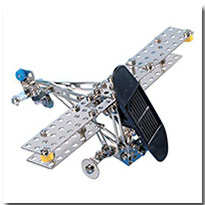 No batteries included -- because there are no batteries necessary! Want a shot at winning one of these? 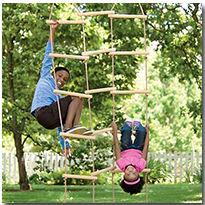 Enter our biweekly sweepstakes by sharing a photo of your neighborhood playground. Start by downloading our Tag! app -- for iPhone or Android. 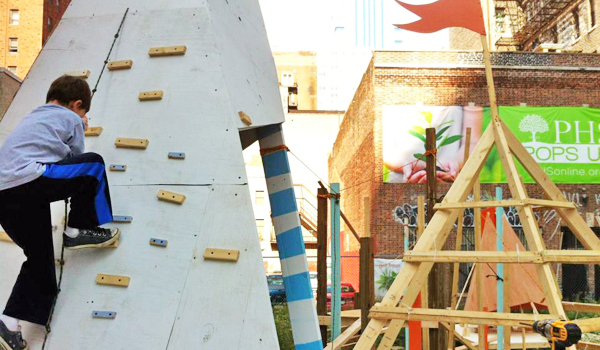 The more playgrounds you share, the better chance you have to win! 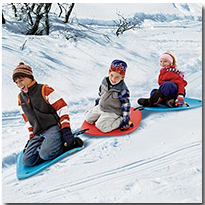 For more gift ideas, check out our Outdoor Play Gift Guide board on Pinterest. You can also pay a visit to some of the toy manufacturers represented here, most notably Hearthsong, Imagine Toys, and Imagine Childhood. 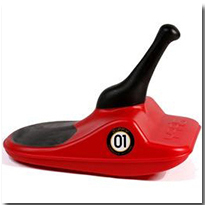 And don't miss our list of all-time favorite toys, here. Need a place to hide? 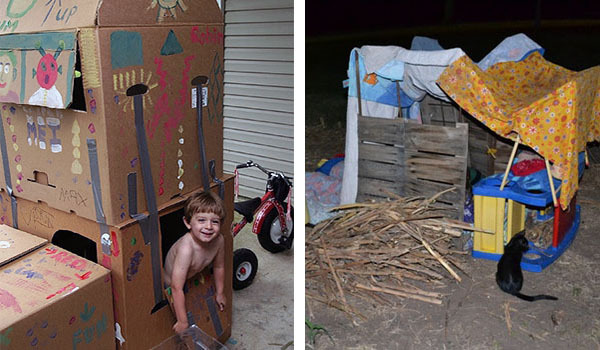 Here are 13 handsome homemade forts. As the cold sets in, most of us will feel an urge to find a cozy retreat. Small spaces beckon to us, spaces where we can huddle up with loved ones and perhaps enjoy a steaming cup of hot cocoa or tea. 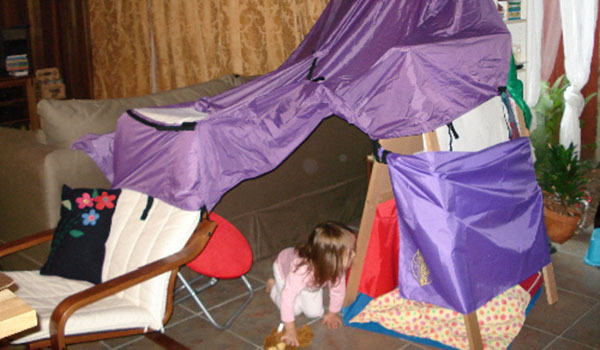 Have your kids made a great homemade fort? We'd love to share it -- please post a photo to our Facebook page. Photographer Ken Mayer says, "My brother, sister, myself, and our friends built this ultimately 3-story monstrosity from scrap we found along the I-66 right-of-way." Photo by Ken Mayer. 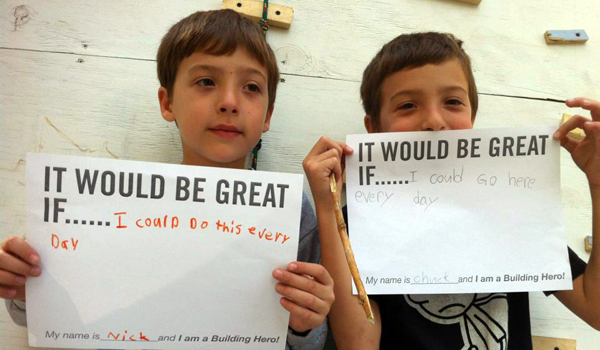 "My son and his friends constructed [this] out of scrap wood a couple of years ago... I was so impressed... I was also jealous," says Jeff. Photo via Upstream of Consciousness. 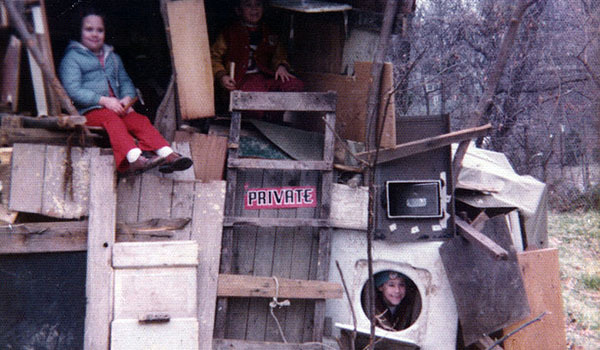 Says the photographer, "Few things are as captivating as an honest-to-goodness homemade fort!" Photo via Take Joy... Take Peace. 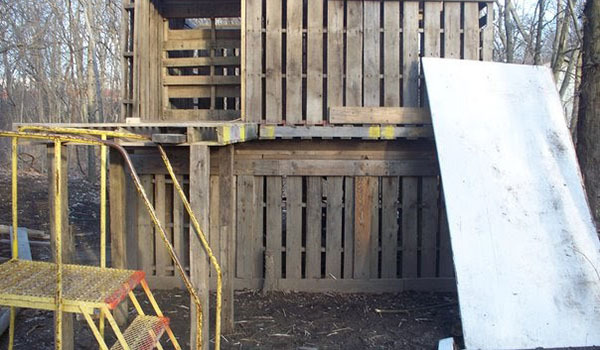 Homemade forts don't have to be elaborate. Cardboard boxes or some blankets and scrap wood will do. Left photo by Brian Mooney (cc). Right photo via A Delightful Glow. Old blankets, sheets, shower curtains, or scrap cloth always add a cozy finishing touch. Left photo via Let the Children Play. Right photo via Child Central Station. Too cold outside? Indoor forts are always an option when the elements aren't cooperating. Photo by ZRecs (cc). 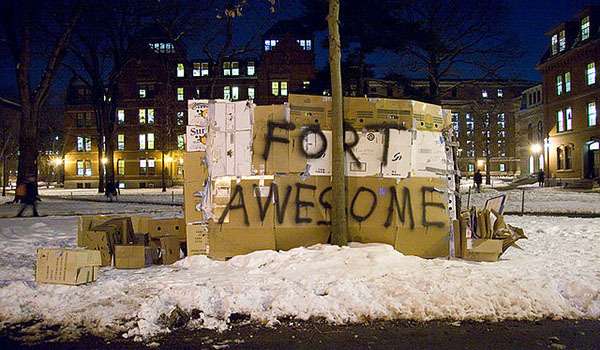 Says the photographer, "Fort Awesome was erected in Harvard Yard in the Winter of 2004. 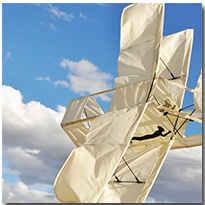 It is one of Harvard's greatest engineering achievements." Photo by David Mooney (cc). 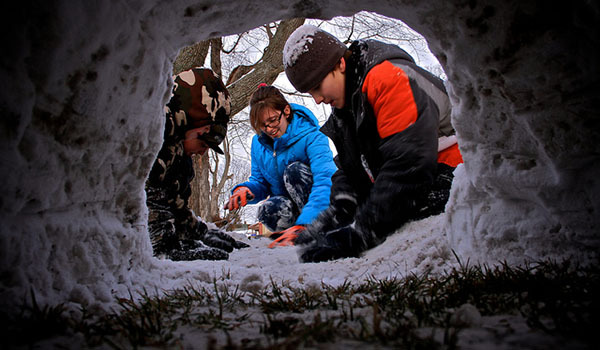 Snow provides endless, and potentially elaborate, fort-building possibilities! Photo by Emily Carlin (cc). 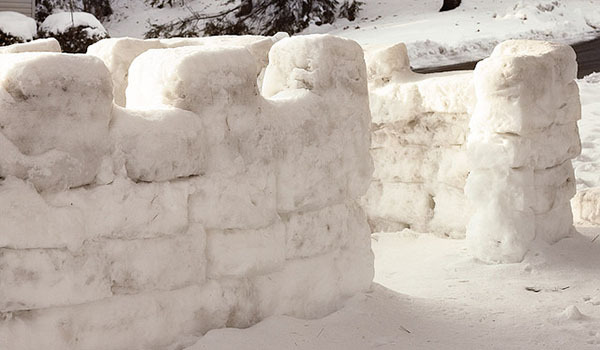 Here's another "snow brick" fort -- and a great place to hide from errant snowballs. Photo by paula (cc). Sticks and stones can break my bones... or they can be used to build an amazing natural fort! Photo by Jason Wilson (cc). Sometimes the best view is from the inside looking out. Photo by John M. Cropper (cc). Think kids can’t handle cold weather? Apparently some schools do, keeping students indoors for recess at mild temperatures of 35 to 40 degrees. 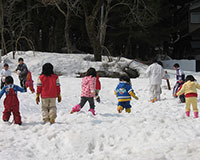 One of our favorite mantras, courtesy of ActiveKidsClub.com, is: There's no such thing as bad weather, only bad clothing. While this may not hold true during extreme weather events -- for instance, a certain hurricane named Sandy -- it is a good mantra for families to live by as the darkness and cold set in. It’s tough to get your kids outside when all the other kids in the neighborhood are holed up in front of the TV, so use a block party as an excuse to lure nearby families out of their homes. Free Range Kids posted a story on one such party in February — in MINNESOTA. If it can be done in Minnesota, you can do it too. 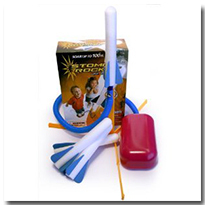 Tempt your neighbors with the wafting aromas of chili and hot chocolate and the delighted squeals of playing children. Photo by Daa Nell (cc). 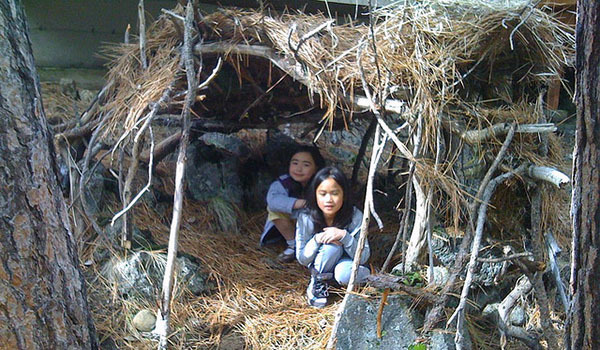 Kids love an outdoor hide-out, and you don’t need nails or construction skills to build one. 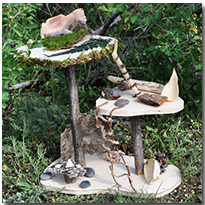 Kids can build their own with whatever “loose parts” on hand: for instance, tablecloths, shower curtains, cardboard boxes, paper towel tubes, or newspapers. The best part? The structure isn’t permanent so they can keep themselves busy destroying and rebuilding it over and over again. 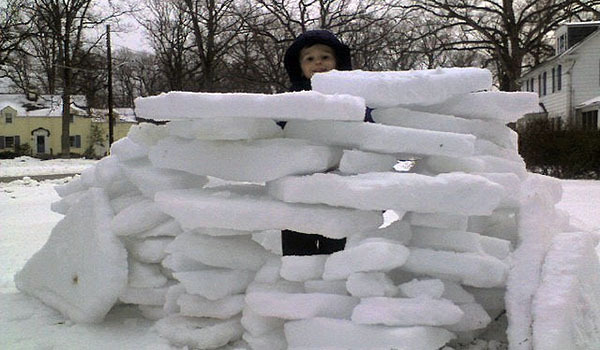 Here are some of our favorite homemade forts. Use the weather to explore the properties of matter with your kids and get artistic while you’re at it. 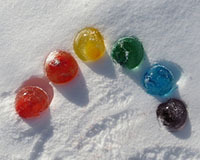 Create cookie cutter sculptures, colored blocks, lanterns, balloon marbles, and lace -- all out of ice! Visit our Winter Play Pinterest board for more inspiration. 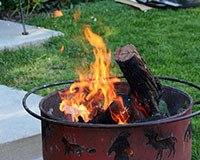 Fire helps stave off cold and darkness, two elements that can bring on the wintertime blues. 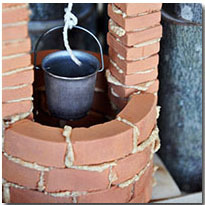 If space in your backyard permits, teach your kids how to safely build and feed a fire. 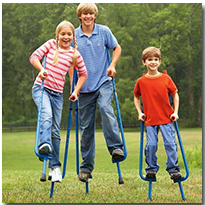 It’s an amazingly simple way to keep your family entertained outdoors for hours after dusk. 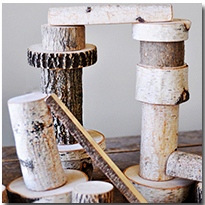 Plus, you can turn winter walks in the park into “treasure hunts” for kindling. Photo by Daniel Imfeld (cc). What advice do you have for playing outside through the winter? We've written here before about folks who want to ban teens from playgrounds. 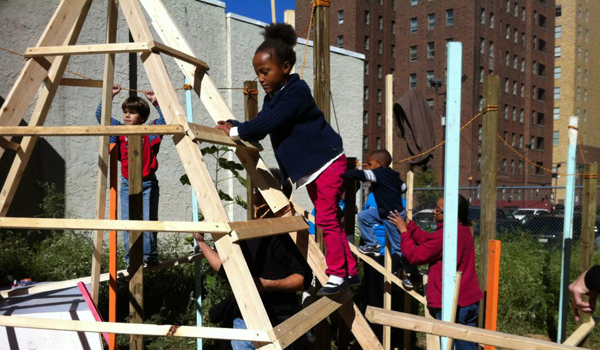 But Alex Gilliam of Public Workshop has a much better idea -- why don't we get teens building playgrounds instead? 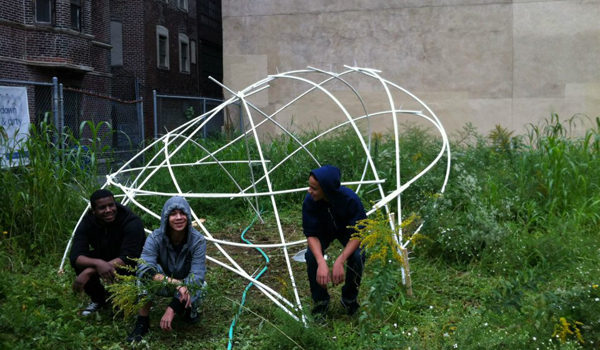 From October 1-15, a group of Philadelphia teens worked with Public Workshop to "design-build" a one-of-a-kind adventure playground in the Pennsylvania Horticultural Society’s PHS Pop-Up Garden. 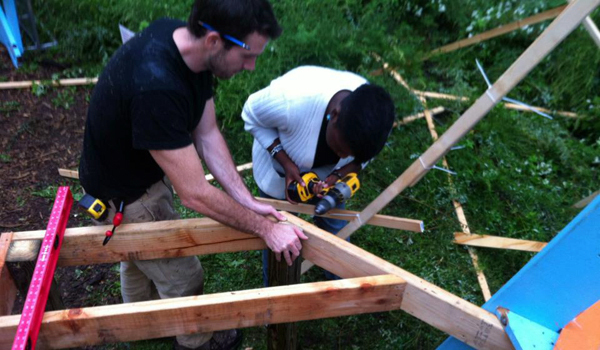 The teens built the framework, then invited kids and their families to imagine what was on, around, and in between. 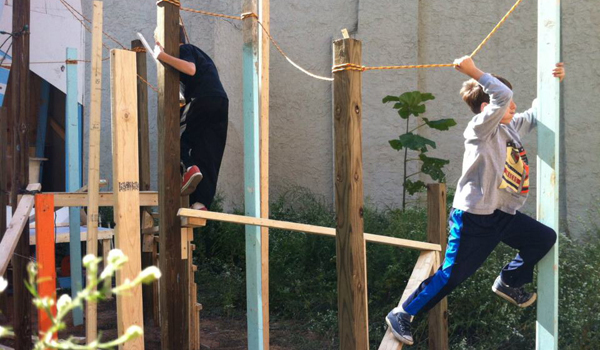 They designed and built ramps, the climbing wall, the swing, a treehouse, a see-saw, and much more. 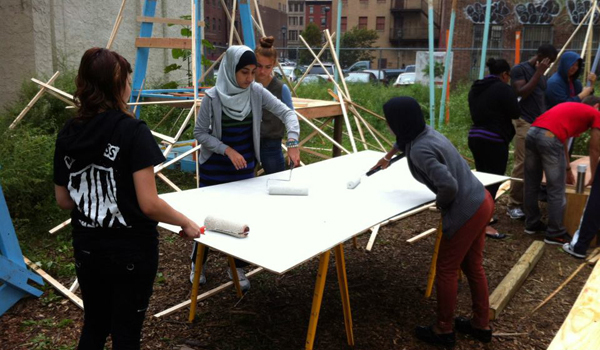 Using simple materials found at any hardware store, the teens, kids, and parents exemplified a can-do spirit while highlighting the importance of play, civic engagement, and community building. Photos courtesy of Alex Gilliam at Public Workshop. Check out more photos and like Public Workshop on Facebook. If you've been following this blog for a while, you might say we're a bit obsessed with cardboard boxes. Well, our love affair continues. If you're thinking about dashing to the store to buy some uninspired costume-in-a-bag this Halloween, think again! 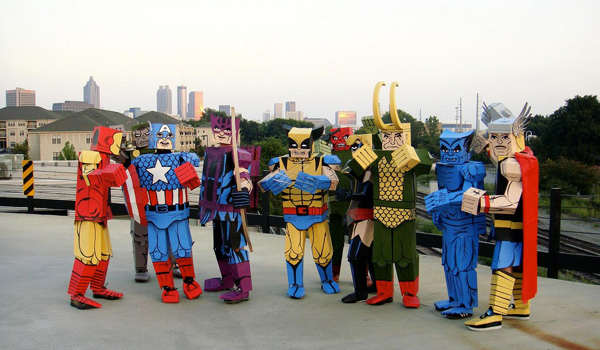 First, check out these 11 DIY cardboard box costumes. 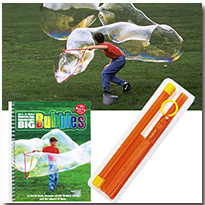 Not only are they cheap, creative, and environmentally friendly, but your kids can get in on the fun. 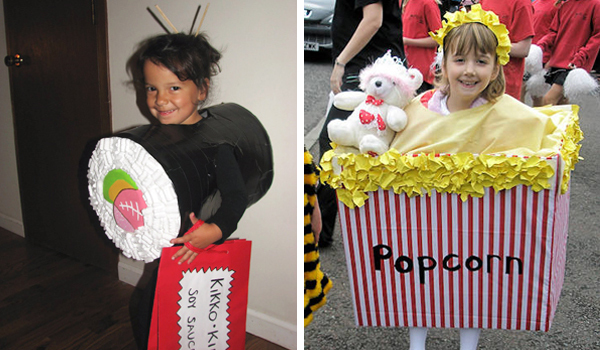 Have you made a costume from a cardboard box? We'd love to share it -- please post a photo to our Facebook page. Kids love trucks. 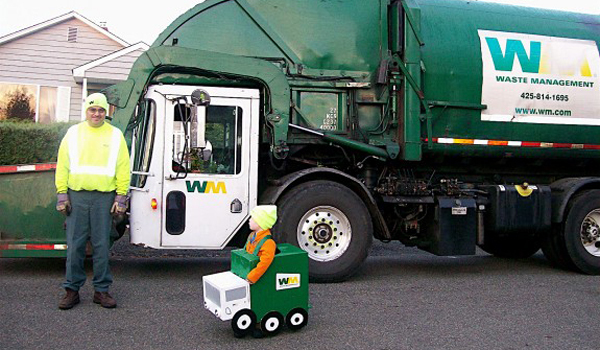 Even garbage trucks. This costume wins the prize for cuteness and authenticity. Photo via Dabbled. Amid all the Halloween candy, these costumes will satisfy your salty cravings. Left photo via Family Crafts. 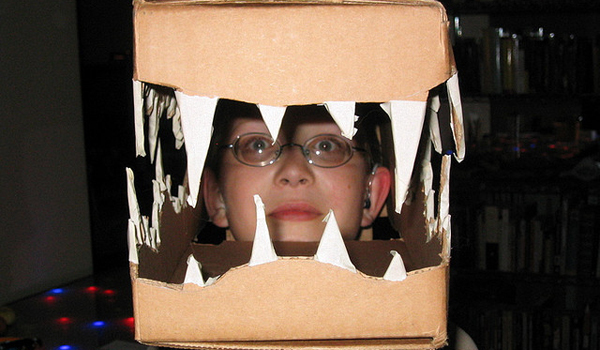 Right photo via The Lovebug Journey..
A cardboard box makes for great crocodile jaws! Photo via Evil Mad Scientist. Let your kids air your dirty laundry. 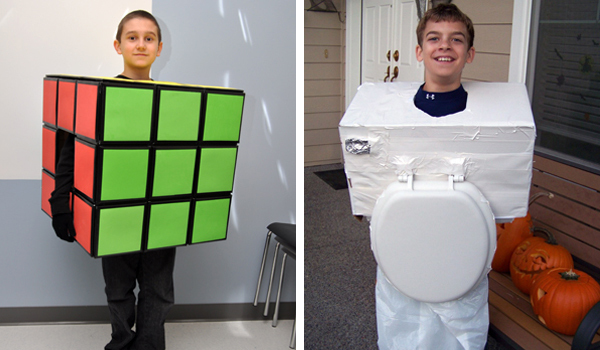 This photo comes to us from "Coolest Homemade Costumes," and we're inclined to agree. 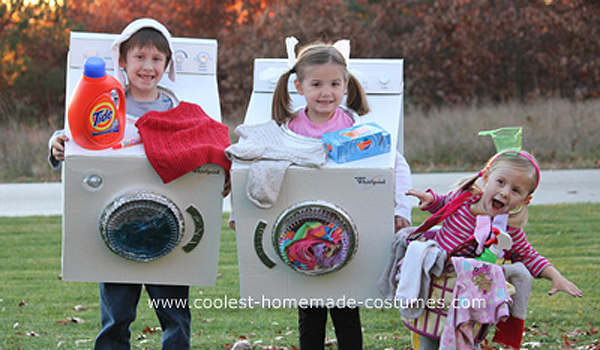 Photo via Coolest Homemade Costumes. We saw lots of Lego people when looking for cardboard box costumes. 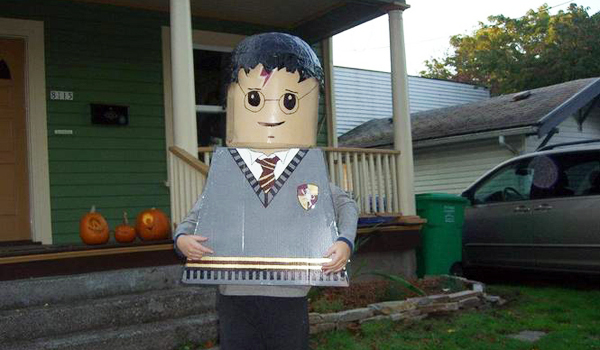 This Lego Harry Potter was our favorite. Photo via The Oregonian. Ahoy, mate! Photo via Creative Crafts. 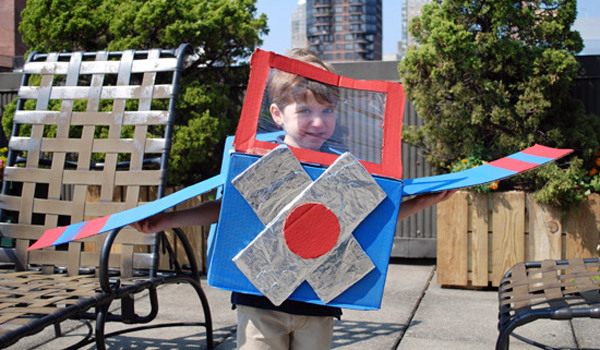 By consuming his body weight in sugar and wearing this airplane costume, your child can fly high on Halloween! Photo via LilSugar. If your child is obsessed with the Avengers, it's time to put your art skills to the test! Photo by Nikejerk3, via Gfest. No kids allowed! The blogosphere has been abuzz lately about the growing popularity of banning children from airplanes, restaraunts, and even grocery stores. 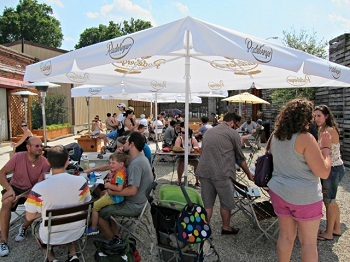 The latest story comes from Brooklyn, N.Y., where a beer garden has banned children after 4 p.m.
OK, some might ask: Why would anyone want to bring kids to a beer garden? Actually, the beer garden (pictured right) was created to be family-friendly, boasting lots of outdoor space and even bocce ball courts. In some ways, the environment seems to echo what we look for in an ideal playground, minus the beer. We celebrate multigenerational gathering spaces that offer a little something for everyone -- if not alcohol for the adults, then shady benches, or chess tables, or even fitness equipment. Regarding the question of whether or not children should be allowed in bars, our admittedly ambiguous answer is: It depends. In Ireland, the classic pub has long been regarded as a family-friendly spot -- a place for children and adults alike to unwind after a long day. On the flip side, we doubt many parents have ever thought to bring their kids to an upscale wine bar, or to a college bar pushing Jager shot specials. Which is precisely why these "no kids allowed" bans have us scratching our heads. Gathering places tend to self-select their clientele based on what they offer and how they offer it. Clearly, all adults, whether or not they have kids, need some space of their own. Likewise, all adults, whether or not they have kids, should also have spaces where they can interact with people across the generational spectrum. The health of our communities depends on it. 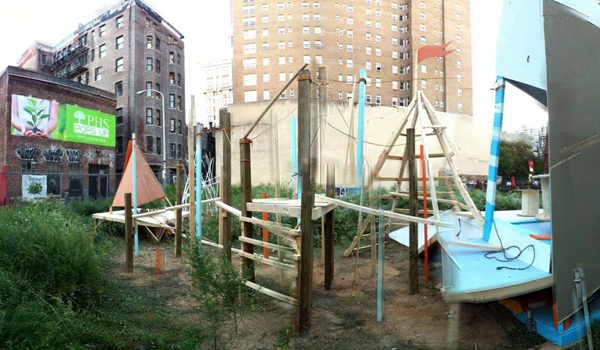 Secret clubhouses might be "kids only," but playgrounds are for everyone. Maybe some beer gardens should be for everyone, too. 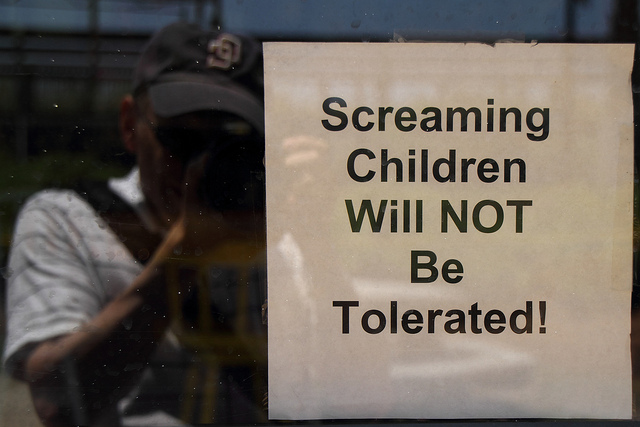 What about screaming adults? Top right photo via Urban Edge. Above photo by Mr. T in DC (cc). There are lots of reasons why you should send your kids outside to play, and here's another: You might be giving them five more years to live. It may sound like hyperbole, but with one in three kids being overweight or obese, today's children are on track to be the first generation with a shorter life expectancy than their parents. A recent study published in Pediatrics found that surprisingly, older overweight children actually consume fewer calories than their slimmer peers. It concludes that low levels of physical activity "may contribute more to maintaining obese/overweight status through adolescence."